It’s amazing how the memory of certain rides can evenly intertwine tendon-twisting trauma with impressions of gliding beside rural idylls within the one recollection. 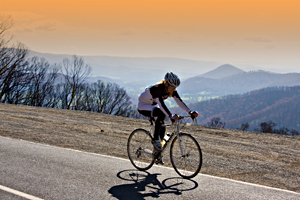 This ride, starting out from Victoria’s alpine ranges town of Marysville, takes in some of the more picturesque rolling green landscapes of regional Victoria as well as climbs with thirst-building workout credentials. The charming foothill-nestling village of Marysville was almost burned into oblivion by the Black Saturday bushfires of February 2009. The township is still recovering and rebuilding, but the area has always been popular with cyclists (it being only an hour or less from Melbourne), and every visit sees more of the township rising up again. 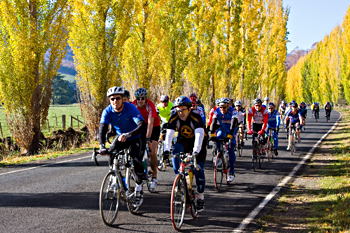 The ride is divided into two main sections, the first a 35km circuit starting and ending in Marysville, and the next section reserved for more hardy cyclists, which is a challenging 22km climb to the summit of the Lake Mountain Alpine Resort and return (weather permitting, but snow season is probably not the best time of year for this). From the eastern end of the main street, turn left up the road to Buxton, which takes you along relatively flat roads with adequate shoulders through gently undulating farming country for about 11km until you come to where the road intersects with the main Maroondah Highway. A left here continues the easy scenic riding conditions along the highway, which may have more vehicles as this is one of the main escape routes out of Melbourne. But it is pleasant cycling, with continuing pastured and lightly forested countryside for about 14km to near Narbethong and the left turn up towards Marysville again. From here on is where the pleasant rolling landscape is replaced by inclines that will challenge the fittest professional, let alone a weekend recreational rider. The toughest climb is nearly a 10% incline for about 2km – the sort of uphill push that begs a “granny gear”. Just tell yourself that it is all good practice for the second leg (although this really depends on the time of year). But when you eventually make the high point about 5km from the last turn off, it’s a very pleasant and cooling off roll/ride down into Marysville, and a coffee if you want one. Keep an eye out for the mobile coffee van “Cross Country Cafe”, which is owned and run by a local couple whose cafe and ski-hire business was destroyed by the fires. The next leg is not really suitable for winter, but well worth keeping in the diary for the warmer weather months ahead. It can get a little gruelling, but the rewards are sweeping views of the Cathedral Ranges and even Melbourne on a clear day. Take the Marysville-Woods Point Road from the same end of the main street where we started the first section, head up the hill just to the right, and just keep pushing! The first 5km seem to be the hardest, even though the incline isn’t as steep as the earlier climb, but this section is more mentally challenging – if you’re not psychologically robust don’t raise your eyes from the couple of metres of bitumen under your front tyre … the road just keeps going up! Hopefully you won’t have my bad luck of getting to a point where every muscle was screaming for a rest only to be hit by an urgent need to keep pushing uphill to get past a very ripe road-kill kangaroo – just as I was at the end of my energy and gasping for air. Uggh… I can still almost taste it. But as punishing as some sections of the climb are, the country is magical, and the views keep getting better and better. Make it all the way to the peak and you really feel on top of the world. The white-knuckled downhill dash back to Marysville is brilliant too, but keep a firm grip and your wits about you, especially if like me you get reckless when fatigued.